First Line: "You are absolutely not selling William Dobson, Rupert!" Growing up, Kat Stanford always believed her mother was a fragile flower, since Iris often retired to her bedroom with bad headaches. Now Kat knows better. All those headaches masked Iris's secretly writing her bestselling romance novels. And Iris's past? It just seems to get Kat involved in one situation after another. This time it's one of Iris's old flames who's come back to Honeychurch Hall to wreak havoc. Well, that and the small problem of the partially mummified body of a young woman Kat finds in one of the abandoned wings of Honeychurch Hall. Hidden treasure, secret rooms, old loves... all these combine to put Kat and her mother in deadly danger. I have a feeling that Hannah Dennison has as much fun writing these Honeychurch Hall mysteries as I have in reading them. They are just plain fun to read, and I always look forward to the next book in the series. Even with the mystery, the humor, and the wonderful characters, Dennison still finds time to show us the plight of many of England's stately homes. If the family isn't titled, or rich, or have their home open to hordes of trampling tourists, it can be tough-- which was why Kat was stumbling around in an abandoned wing of Honeychurch Hall. Its owners are desperately strapped for cash, and she was using her expert knowledge of antiques to find something they could sell so badly needed repairs could be made to the house. The owners of Honeychurch Hall are a mixed bunch. In fact there's only one of them I truly like: young Harry who hates boarding school and, as "Captain Bigglesworth," likes getting into adventures with Kat as his trusty aide. Why am I not all that fond of Harry's family? For generations, they've been able to get involved in all sorts of nefarious doings and come out smelling like roses because the police (and everyone else) covers their tracks. Must be my peasant blood rearing its ugly head. I also have a problem with Kat's mother. Iris is just a bit too self-absorbed and spoiled for me. Kat's father let Iris do as she pleased-- and she did. She has also been plowing all the money from her books into offshore accounts. Why couldn't her family benefit in some way from all that? As a main character, Kat is pretty much perfect. Smart, funny, and getting used to dealing with situations that can often resemble slapstick comedy. Hopefully she's going to get her antiques business up and running soon. I've been looking forward to that for three books now. All right. Enough about the characters already! Can you tell that I'm hooked on Dennison's cast? 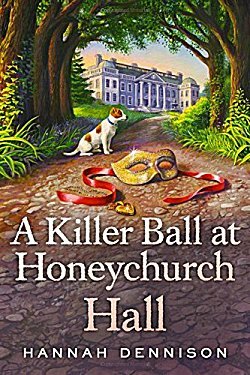 The mystery in A Killer Ball at Honeychurch Hall is a good one that kept me guessing. As a matter of fact, I didn't know the identity of the killer until Kat did, and I love it when that happens. If you haven't tried this series yet, I hope you will. You can dive in anywhere and not be hopelessly confused, but I'm hoping you'll begin at the beginning (Murder at Honeychurch Hall) because-- like I've said before-- these books are so much fun. I'll admit, Cathy, I only sort of skimmed your review, because I've got this one coming up on my own TBR soon. But I am glad to know you liked it as well as you did!